Reference number for this case: 14-Oct-54-Marseille. Thank you for including this reference number in any correspondence with me regarding this case. 13 h. 30. A saucer! a saucer! Alerted by children who first saw it it in the sky, all the population was soon in agitation. A white disc hovered slowly above Fountaine-de-Vaucluse. Large artillery binoculars at the eyes, it was possible to clearly distinguish a large white disc surmounted of a segment of a sphere of the same color completely similar to a silver-coloured bowler hat. The lower circular edge carried, intermittently, two powerful fires, variable from the white to the purplished, passing by the red, oscillating on the axis of the large lower disc. The whole sometimes appeared in the shape of a bowler hat, sometimes of a rhombus, sometimes of a simple disc with brilliant edge, from where two fixed lights, diametrically opposite, were intermittently quite visible to the naked eye. No smoke nor noise. The air base of Caritat, alerted, at once sent two jet planes which, at about 2 p.m., made their appearance in the sky of Vaucluse. Our correspondent was on the telephone with the air base, from where one communicated by radio with the planes. It was easy to guide the apparatuses on the saucer. After two turns on Fontaine-de-Vaucluse, the planes took altitude and dove fast on the reported object. The radio of the planes announced that the saucer was in sight, that they chased it, but that it escaped with a speed higher than theirs. Indeed, from Vaucluse one saw the saucer clearly starting out like an arrow with the two jets following. of flying cigars" seen by a policeman, two other residents of the Gard, Mr. Dupuy and his wife, saw last night when going back home at a few kilometers in the north of Nimes, a greenish gleam in a field. They approached and noted with all the time they needed the presence of an object entirely identical to a rugby ball and appearing to rest on crutches. Suddenly, the strange apparatus rose in the air while emitting a weak noise and gradually taking an orange colour. At present, one sees a little everywhere flying saucers or flying cigars crossing space at vertiginous speeds. The details do not miss on these mysterious machines. But whereas the majority of people question testimonys that one often describes as whimsical, many people cherish the secret hope to see such a phenomenon. While making the usual reserves on these daily visits of extraterrestrial objects, we hoped that one day, we too, would be the witnesses of this still rare display. Well, yesterday evening, we were privileged. We had the opportunity to see one of these phenomenon. Unfortunately, it was not a "saucer". Too bad, for we then would have been really convinced. Here is exactly what we had in front of the eyes. We were on the Daviel square, at 06:09 p.m. exactly and while the day declined, that it was dark, a very luminous machine, very large, of yellow color orange, appeared to us in the east of the city. In the shape of large ball, it moved at an incalculable pace, leaving a trail nehind it which disaggregated immediately. After having seen it five or six seconds, the machine disappeared towards the north, i.e. the Estaque. What to compare it with? Quite simply with a shooting star with centuplicated dimensions. There was absolutely no noise. Our "vision" was to be confirmed to us little afterwards. These testimonys are surprizing. At the same hour, i.e. exactly at 06:09 p.m., Mr. Gaston Laurent, who was in Redon with his young 10 years old niece Janine, had the display in front of the eyes. - This machine which moved without noise, coming from the East, he told us, let itself be seen ten seconds then disappeared suddenly. It seemed to dive on Carpiagne. "Its color was definitely orange and sparkled. Anyway, it was not a plane. I am formal. A little later a telephone call emanating from Vaucluse alerted us. It was Mr. Rigaud, from Rasteau, who, at 06:21 p.m., had seen a pinkish ball. It moved towards North. What is this phenomenon which crossed Marseille yesterday evening? Some will claim today that they too saw the phenomenon. According to imagination, it will be a "saucer", a shooting star, a meteor! For our part we will not affirm anything precise. Like our correspondents, whose testimonies we we report above, we will be satisfied to modestly say that it was really an unknown machine, but neither a plane nor a saucer. It enabled us to be neither for, nor really against the existence of these luminous objects. These two authors indicate that in Marseille at 06:09 P.M. on October 14, 1954, a large luminous ball was seen by many witnesses. It left a trail behind itself. "Marseille - 13 - 06:10 p.m.: untraceable witness after investigation. Brief phenomenon." 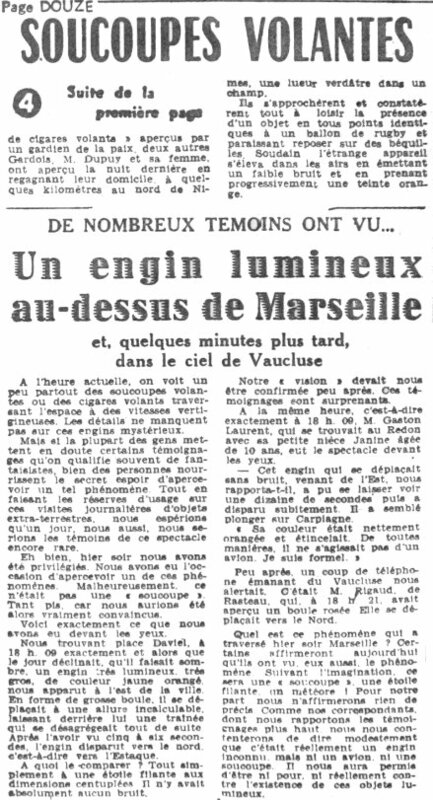 Luc Chastan indicates in his database that in the Bouches du Rhône in Marseille on October 14, 1954 at 18:09 hours, there was a "Large luminous ball leaving a trail behind it (seen by very numerous witnesses)." 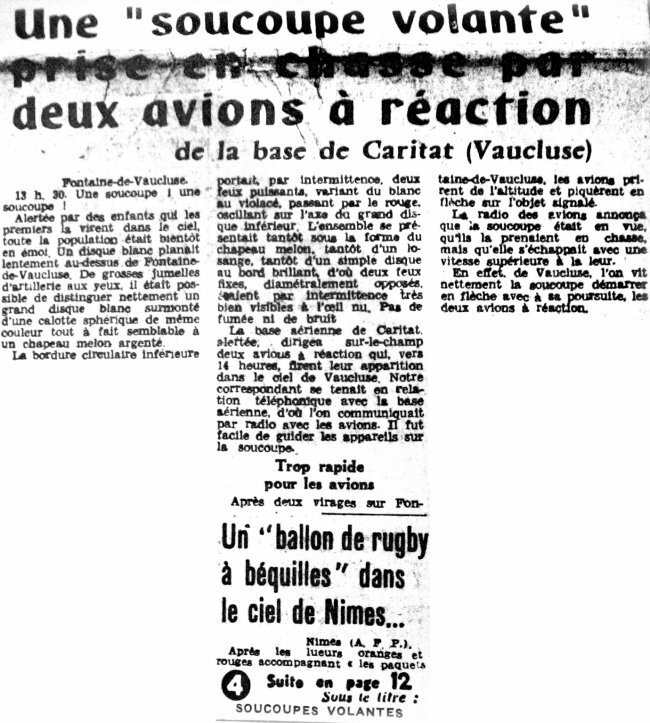 The website indicates that on 14 October 1954 at 18:00 in Marseille, France, "An unidentified object was sighted, but with appearance and behavior that most likely would have a conventional explanation. One object was observed." 1.1 Patrick Gross July 28, 2010 Addition [lp1]. This page was last updated on July 28, 2010.